Announcement Thanks for stopping by! Here you'll find one of a kind handmade gifts for kids. Enjoy! Thanks for stopping by! Here you'll find one of a kind handmade gifts for kids. Enjoy! 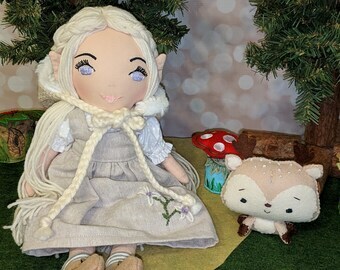 This doll is beautiful and the clothes well made. I love that the doll actually has little underpants. I am a past sewer, so I can appreciate the quality of your work, thank you! outfits and they are lovely as well. We will definitely be back and would recommend this shop to anyone looking for high quality Waldorf dolls. Thank you! Wow, this doll is so well made and beautiful! We gifted it to our 8 year old for Christmas and she hasn’t stopped playing with it for 5 hours. I cannot get over the care and love that went into the clothes and the doll itself. Thank you so much! Your little one's imagination will soar with our wool felt finger puppet and quiet books. Expressing my self through creating something handmade has always been a part of my life. As a young girl I would pour over craft books at the library planning my next project. It usually started with finding supplies around the house, sometimes cutting up clothes to make rag dolls, and when I could earn a few dollars, I would save up for a trip to the fabric and craft store for the good stuff! As I grew older I made everything from prom dresses for my sisters and me, to curtains and pillows for my new home, and baby bedding, clothes and stuffed toys for my son, nieces and nephews. One of my favorite craft mediums is wool felt - yes, the good stuff. All of my felt play sets and scenes are made using either 100% merino wool felt, or a combination of wool and 20-35% wool blend felt. The quality, durability and versatility of wool and wool blend felt cannot be compared to store bought craft felt. 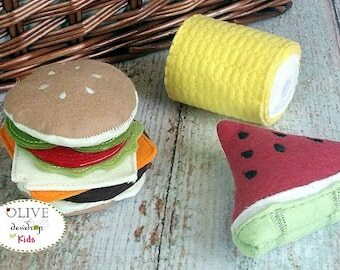 A lot of hours go into making each and every felt creation in my shop and I know they will be loved and treasured for years to come, so we want each felt creation to endure the test of time and little hands! I love what I do and look forward to creating something special for you! Thanks for stopping by Olive and Dewdrop! 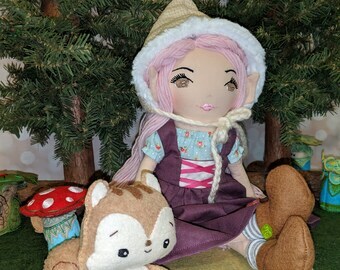 I make whimsical handmade Waldorf style dolls, cloth dolls and animals all with an array of clothing to dress them in. 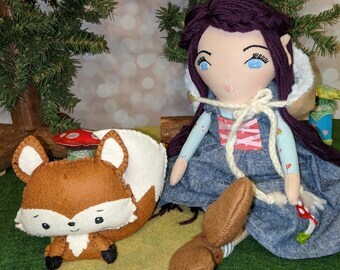 I also love all making all manner of woodland animals, fairies and mermaids too! If you are unsatisfied with your purchase, please contact us immediately so we may remedy the situation. Fabric sales are final. We accept PayPal (you can pay with credit card using PayPal too!). Florida residents pay 7% sales tax. Ready to Ship items ship within 1-3 business days. Custom orders or Made to Order items require up to two weeks for production from the day the order is placed. Allow an additional 3-5 days for delivery of your item after your order ships. Tracking information is e-mailed to youreetsy address when your order ships..
We love custom orders so send a convo to discuss having us make something just for you! Keep in mind that custom orders require up to two weeks for production prior to shipping so plan accordingly!